Flamingos definitely took this summer by storm. 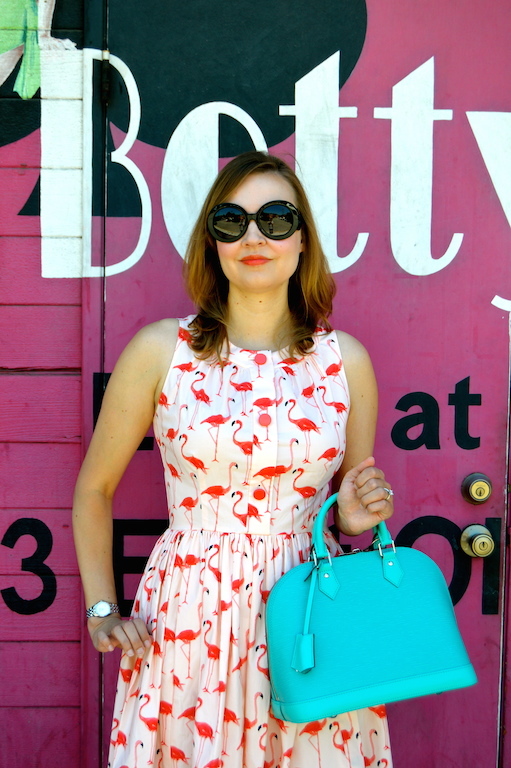 From adorable dresses like the one I am wearing today from Kate Spade, to footwear, bags and even iPhone covers, it was hard to ignore these colorful, tropical birds. I finally got my hands on this dress a few weeks ago when it hit the sale racks at Kate Spade. 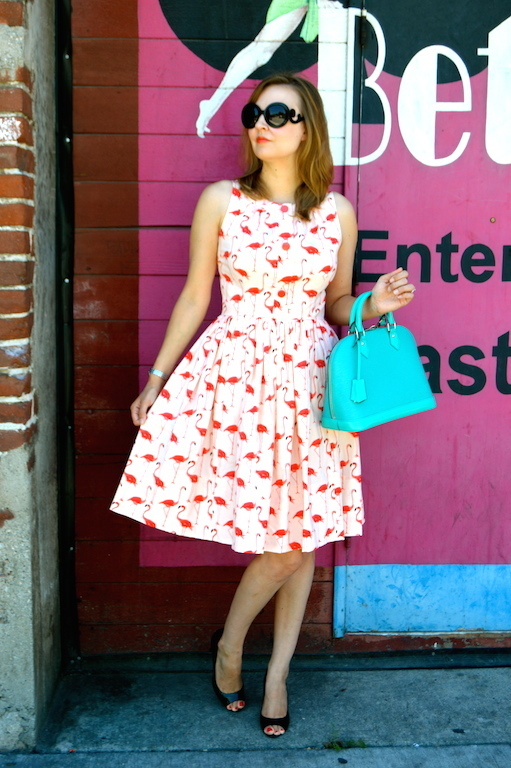 The print is adorable and the classic, vintage fit and flare style is just icing on the cake. It's no wonder that it sold out shortly after going on sale. Even though the flamingo print obviously screams "summer", I do think I might be able to transition the dress into fall or winter with the right accessories. Today I opted for a bright summery turquoise bag, but in a few months I might give the dress a more subdued twist with some darker accessories. I'm not sure if you could ever call something that has an army of flamingos on it "subdued", but I'll give it a try in a few months and let you know how it goes. As I previously mentioned, flamingos aren't just for zoos anymore or your favorite tropical destination. Designers really went crazy, featuring these birds on just about everything. 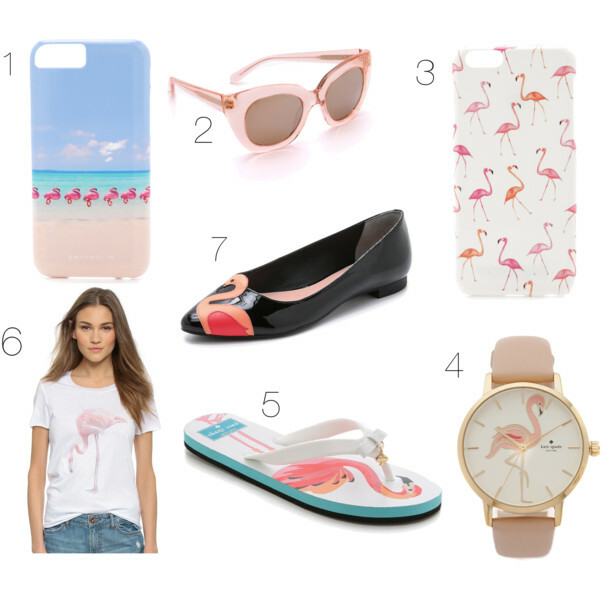 Below are some of my other favorites featuring flamingos, I especially love the Kate Spade flamingo watch; it just might be next on my flamingo wish list! It looks like I'm off to Betty's, but I'm not actually sure what Betty's is! It looks like a bar, but it could be a lingerie store for all I know! 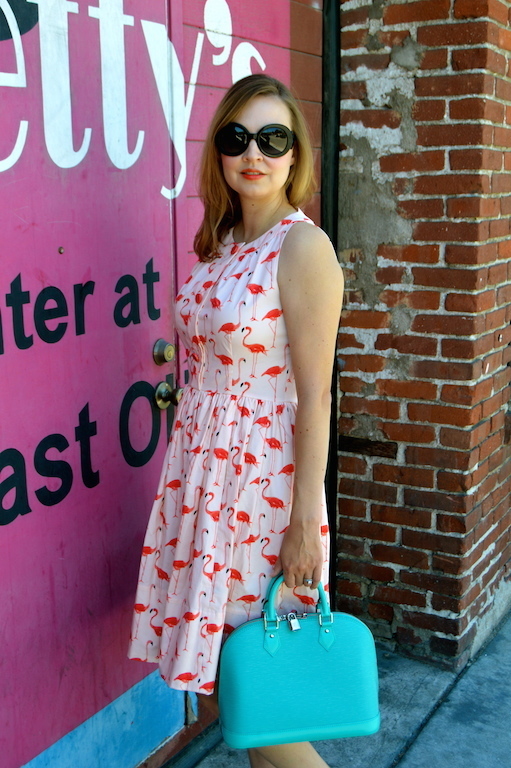 I just love the vintage motif, pin-up girl and the pink color of the door that matches my flamingos today. If I ever find out what it is, I'll let you know. This dress is so fun! I love the color combo of coral and turquoise too! This is just beyond adorable, and with that turquoise bag, it's heavenly! You look absolutely beautiful, fun and also chic! how cute is this print?! Love how fun this look is! That dress is so fabulous! I love that you embraced the whimsical print and silhouette for a vintage inspired look. love the dress! it is the cuttest! What a fun dress and I think it could totally be a transitional piece for the Autumn. 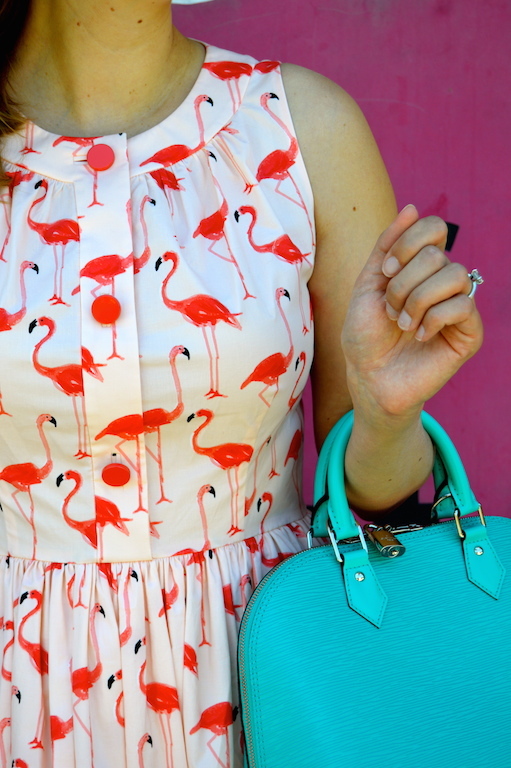 And the turquoise bag looks fabulous against the colours of the flamingos. I love the photo of you trying to enter Betty's. Over here, Betty's is a famous tea room in Yorkshire so the dress you're wearing is perfect for a typically British afternoon tea! How fun is this dress!? 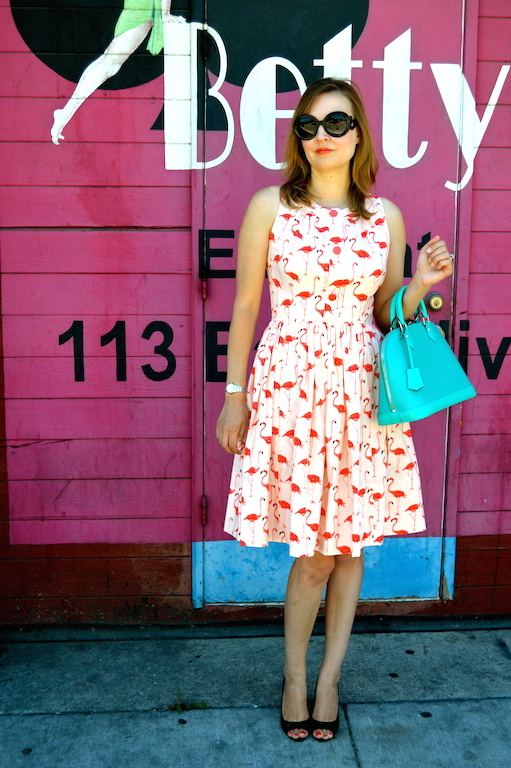 I'm in love with flamingo printed items right now and this dress totally caught my eye! I LOVE that dress! Flamingo print is so fun. Love how you kept things bright with the turquoise bag! that dress is way adorable!! That dress is adorable and looks great on you. What a lovely dress, I love it! I think a jean or leather jacket over it for the fall would be cute, but I can't wait to see how you style it for fall. Thank you for linking up to "Bloggers Who have Inspired Me" yesterday.